ISGE’s Belmont Undergraduate Mock Trial team brought home from the Blues City Scrimmage at Rhodes College and pose here at Belmont University in Nashville, Tennessee, November 7, 2018. 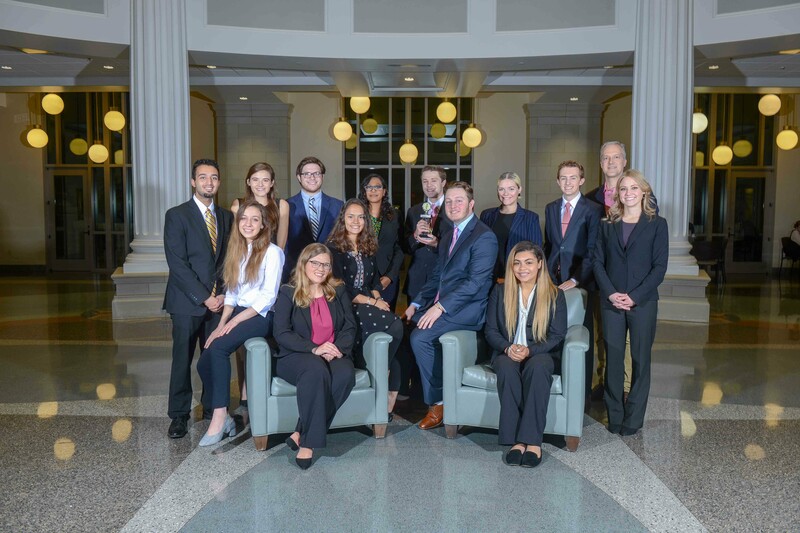 Belmont University’s Undergraduate Mock Trial Team Blue recently took third place out of 18 teams in the 17th Annual Blues City Scrimmage held at Rhodes College in Memphis. A second undergraduate Belmont Mock Trial team, the BeeKeepers, placed tenth. The two teams, made up of six students each, won six of eight ballots defeating teams from across the southern region. Luke Worhsam and Kevin Botros were named team MVP’s. Following the victories in Memphis, Belmont’s teams traveled to Murfreesboro for the MTSU Annual Mid-South Invitational Mock Trial Tournament. There, Worsham won two awards as top attorney; one as plaintiff attorney and one as defense attorney. Sarah Lancaster and Elia Despradel both won top witness awards. The Undergraduate Mock Trial teams are coached by Adjunct Professor and Attorney Summer Melton, a Belmont College of Law graduate. She is teaching team members in a pilot course, Undergraduate Pre-Trial Procedure and coaching them as they prepare for the Regional AMTA competition in February 2019. Mock Trial at Belmont is part of the student-led Pre-Law Society. Its interdisciplinary team includes members from six colleges on campus. Team Blue includes Luke Worsham, communications major; Elia Despradel, social work major with a double minor in political science and psychology; Bailyn DuPont, political science major; Carmen Mendez, legal studies major; Sarah Anne Pfitzer, English major; Aubrey Keller, english literature and Chinese major and Hunter Lindsey, politics and public law major. Team BeeKeepers includes Sarah Lancaster, motion pictures major; Grant Bauer, politics and public law major; Kaleb Gille, politics and public law and Spanish major; Elizabeth Sutphin, global leadership studies major and christian ethics minor; Kevin Botros, political science and philosophy major with a minor in sociology and Sydney Floyd, business administration major. Belmont’s team relies on SGA grant funding, private contributions and is partially sponsored by Interdisciplinary Studies and Global Education.